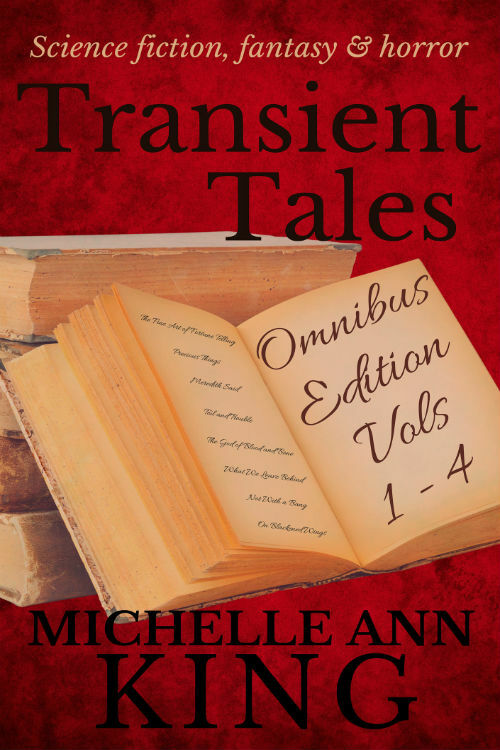 Fiction by Michelle Ann King: November Ebook Sale! Transient Tales Omnibus 1: forty-six funny, sad, and thrilling stories of science fiction, fantasy and horror — featuring dysfunctional (and sometimes demonic) families, a time-travelling reality TV show, a Halloween game with a chilling price, robot wolves, carnivorous plants, a call-centre at the end of the world, witches, doppelgangers, misanthropic psychics, immortal gang bosses, apocalyptic survivors, alien voyeurs, flesh-eating criminals, a cunningly-disguised space teleport device, zombies (some helpful, some not so much), and much, much more! Available for just $0.99 / £0.99 from Amazon UK / Amazon US / Smashwords now! Go here to check out all the other offers from Milo J Fowler, Daniel Ausema, James Garcia Jr., Anne E. Johnson, Simon Kewin, TB Markinson, Tyrean Martinson, Rhonda Parrish, and Loni Townsend. Grab a bargain!